Harrogate craft beer will get a starring role at the StrEat Food Festival this weekend in Harrogate. The countdown is on. The return of the popular street food and drink festival in Harrogate is only hours away - and it's moved. Streat Eat festival will take place from Saturday, May 26 to Monday, May 28 - and after a few years in Valley Gardens this feast of fun, food and drink will be in a new home at the Great Yorkshire Showground. As always at this family-friendly event, there will be an amazing line-up of street food traders all getting ready to descend on the Great Yorkshire Showground with a world of tasty servings - Lebanese, African, Caribbean, Greek and a lot more. 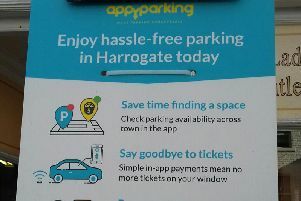 Organiser, Harrogate businesswoman Cathy has kept tickets at £5 per adult with children under-13 free with heaps of free parking. The Craft Beer Teepee will be serving beers and ales from The Great Yorkshire Brewery. Revellers won't have to wait long for organisers are introducing a revolutionary new drinks system which fills the glasses from the bottom up at top speed! For art lovers, there will be a new exhibition Britain is About to Change by esteemed artist Peter Dench. Doors at the Streat Eat festival will open at noon each day and last entry will be 6pm each evening.